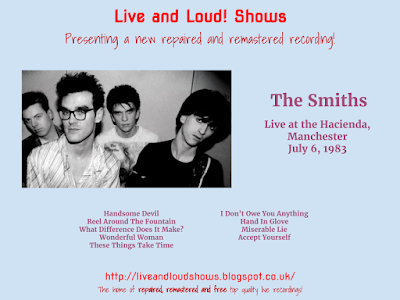 The first time I've done a gig by The Smiths. This is from around the time they signed their record deal with Rough Trade, shortly after the release of their first single, Hand In Glove. This was a mono soundboard recording of their 2nd appearance at The Hacienda, with a lot of boomy mid range which was ok played quietly but got wearing on the ears after a while if the volume was up. So a good candidate for a cleanup! I've done a "pseudo stereo" effect with it, then rebalanced the sound to keep it sounding more natural. Then, I removed hiss and some digital crackles and pops before EQ'ing it to remove that mid range boom, tighten up the bass end a bit and improve the clarity. Unfortunately most of I Don´t Owe You Anything is marred (no pun intended) by some low level digital distortion - I guess that was generated when it was transferred from tape or vinyl to digital format. Its not unlistenable but just to make you aware its there - I was able to remove a bit but not most of it. Despite that the finished result is a nice, clear recording which sounds great overall now. The show is available to download here as 1 MP3 file. Or, if you would like to have separate tagged MP3s, or even lossless files in FLAC format, head on over to the Donations tab to see how you can obtain these for a very small donation towards the site costs.